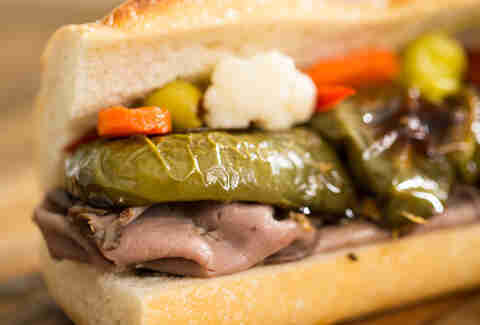 Ah, the Italian beef -- Chicago's tender, dipped sandwich of the gods. If you live in Chicago, you can never have enough of them, and if you don't live in Chicago, you can never have... them at all. Luckily, Thrillist Chicago editor and Italian beef aficionado Jay Gentile has EVERYONE covered. He went to Al’s #1 Italian Beef -- the place that started it all -- and got us (and you!) the recipe. What he did to get it, though, goes with him to his grave. Buy a 5lb rump roast with lots of marbling. A sirloin tip roast or top round roast will do, too, but just make sure it's got lots of fat, because it's important for flavor development. 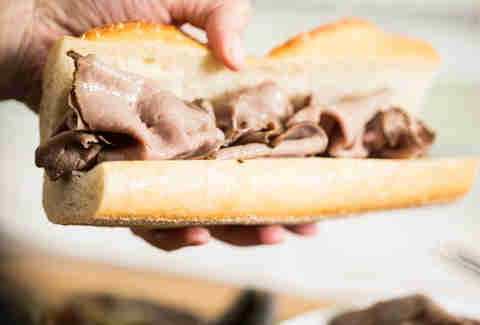 You’re going to lose about half of the roast in the cooking process when that delicious fat melts off and turns into the sauce (Al’s calls this gravy) that is essential to a good Italian beef. Get a big roasting pan -- big enough to bathe a baby in. More specifically, six quarts or larger. The stew needs room to dance, which it will, you'll see. You’re going to want to do what most would call over-seasoning the roast. Some people may think a whole head of garlic is overkill, but what do they know? 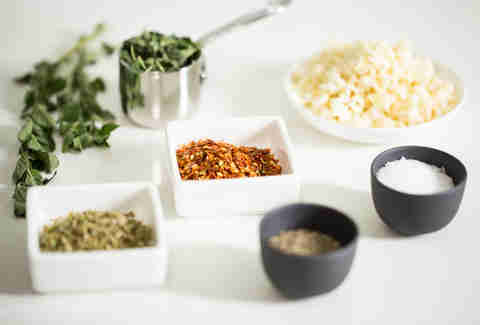 Pile on the salt, pepper, oregano, and hot pepper flakes, too. Really load it up. 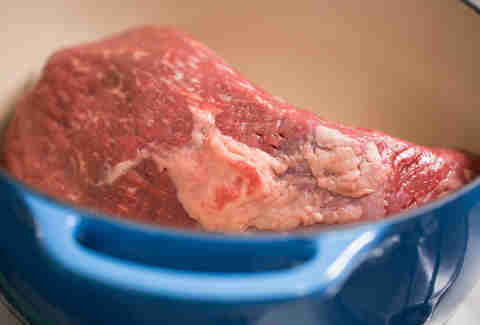 Put the seasoned roast in the pan along with three quarts of water, which will become the gravy used for the beef. Preheat the oven to 375℉ and cook uncovered, fatty side up, for 1 to 1½ hours. 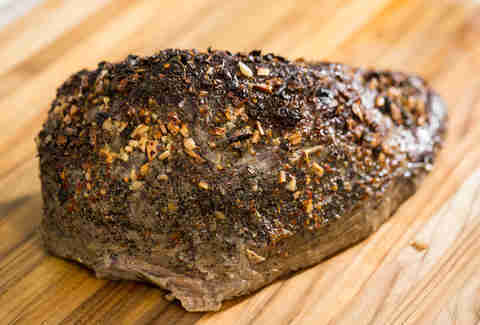 You’re looking for the center of the roast to be about 150℉, which will result in medium to medium-well done beef. When the roast is done, let it cool to room temperature. Then remove the roast, wrap it up, and put it in the fridge overnight. 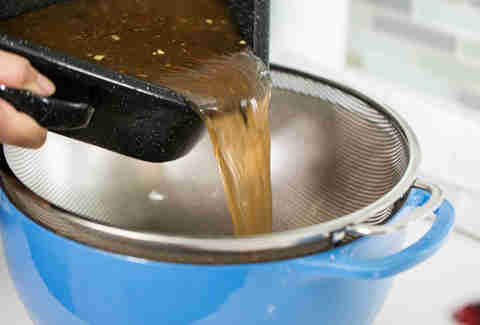 Pour the broth through a fine mesh strainer. Toss out all those chunks, but don't you dare touch that precious fat. Stick the gravy in the fridge overnight, too. The next day, the fat will have solidified and risen to the top. What did I say about touching the fat? Don't! It is the key to that awesome Italian beef flavor. Pour the gravy into a wide pot and bring it to a gentle simmer (not boil) over low heat. Cover and let it simmer for 30 minutes to develop the flavor. Roast the peppers while the gravy simmers. Cut several sweet bell peppers into fat, long chunks that you can lay across the length of the sandwich. Toss with olive oil, fresh garlic, salt, and pepper on a rimmed baking sheet. Pop them into the oven at 350℉ until tender, about 30 minutes. 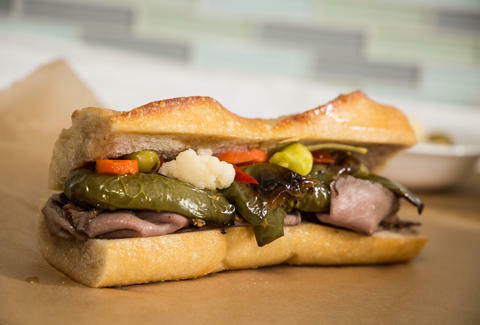 The "hot" in an Italian beef comes from giardiniera, a pickled relish of spicy peppers and vegetables. Al’s makes its own and insists it's more complicated than making the beef. Buy hot giardiniera at the store and save yourself the trouble. 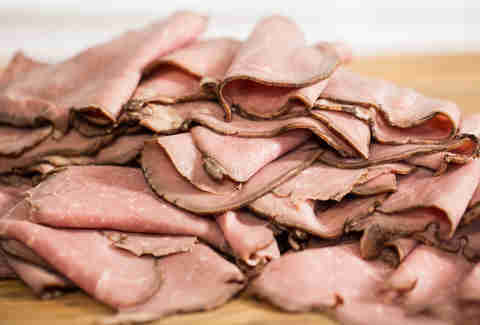 Al's recommends a deli slicer, but do you have a deli slicer? I didn't think so. Just use a sharp knife and a sturdy hand to get the thinnest slices you can. If you have a lot of excess fat on the roast, you'll want to trim that off first. Add the sliced beef to the simmering gravy for an extra 15 to 20 minutes so it can soak up that delicious juice. Any good sturdy Italian or French bread will do. Not a crispy baguette or soft hoagie, just a nice, fresh loaf that you can cut into 6in subs. Cut the bread open from the side, leaving one edge attached. Stuff it with a generous heap of beef. Top the tender, juicy beef with a couple slices of sweet peppers and spoonfuls of hot giardinera. Allllllmost there. 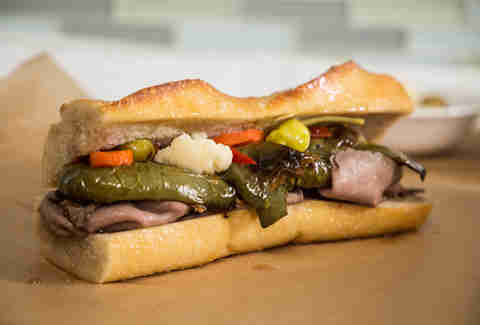 There are several ways to eat Italian beef, which I'm sure you'll all share in the comments section, but Al’s way is “sweet hot dipped.” This means topped with sweet peppers, hot giardinera, and the whole sandwich quickly dipped in the gravy. Adding cheese makes it a "grinder," and if you're going to do that, you may as well put ketchup on your hot dog, too. To dip, grab the sandwich with tongs and submerge it in the gravy for just a second. Let it drip a bit and you're ready to go. There's nothing tidy about Italian beef. Unless you want beef sludge all over your shirt, you'll want to take on "The Italian Stance." Place your feet nice and wide, stick that booty back, elbows on the counter, and dig in. Whatever falls out, falls to the floor (remember, two-second rule). Stretch pants are optional, but I personally think waistbands are for quitters. Season the roast with a head of minced garlic, 1 tablespoon salt, 1 tablespoon black pepper, dried oregano, fresh oregano, and red pepper flakes. Place it in a 6-quart roasting pan or Dutch oven. Pour 3 quarts of water into the pan (not directly over the roast). 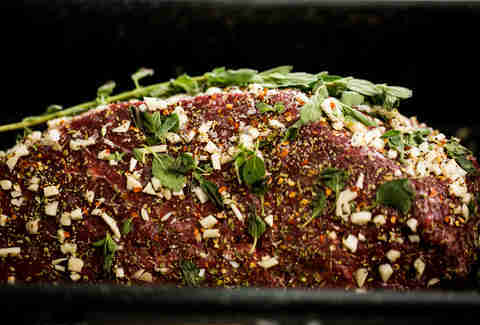 Bake for 1 to 1½ hours or until the center of the roast registers 150℉ on a meat thermometer. Let the roast cool to room temperature. Remove roast from the pan, wrap it in foil, and refrigerate overnight. Pour the broth through a fine-mesh strainer into a container and refrigerate overnight. The next day, transfer the broth and any fat into a wide pot. Bring to a gentle simmer (not boil) over low heat. Cover and simmer for 30 minutes to develop the flavor. In the meantime, make the peppers. Preheat oven to 350℉. 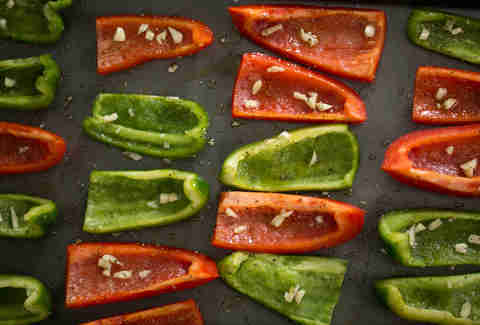 Coat bell peppers with olive oil and remaining 2 cloves garlic, 1 teaspoon salt, and ½ teaspoon black pepper. Roast on a baking sheet for 30 minutes, until tender. Trim excess fat off the roast; cut across the grain into thin slices. Add sliced beef to the simmering gravy for an extra 20 minutes. Cut bread into 6-inch-long pieces. Cut each piece open from the side, leaving one edge attached. Stuff the bread with generous heaps of beef. Top with sweet peppers and spoonfuls of hot giardiniera. 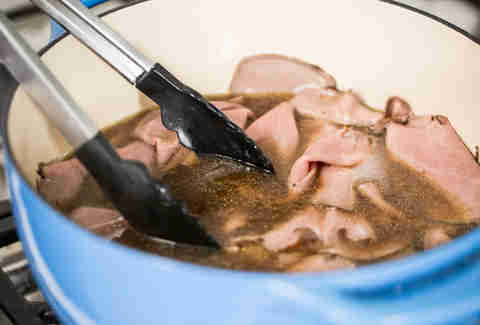 Using tongs, submerge each sandwich in the gravy for just a second. Let excess liquid drip off and serve immediately.